The road at the canal basin takes you over the River Skell and up to the town square. 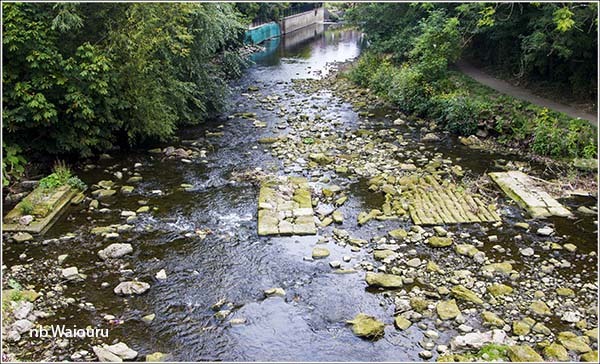 Looking over the bridge parapet you could see the foundations of the piers for a much earlier and narrower stone bridge. 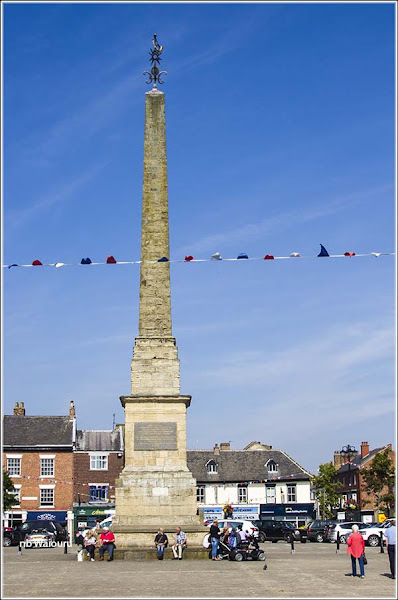 There is a stone obelisk in the centre of the town square. It was erected in 1703 to replace an earlier market cross. There is a plaque on the obelisk which mentions half the cost of it’s construction was met by the local member of parliament. However wikipedia mentions his father actually paid. Typical politician! It’s from this obelisk that one can view the horn piper blowing his horn at 9.00pm each night. This signalled the start of the “nightly watch” which ended at 4.00am the following morning. An early form of local policing. 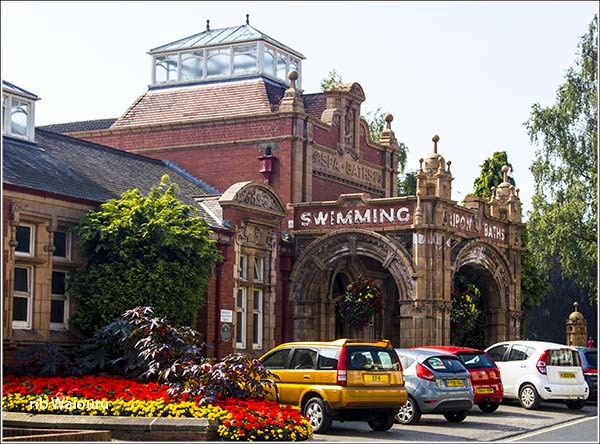 We wandered out the other side of the town looking for a pub when I noticed a Victorian (or Edwardian) looking building. Leaving Jan, I went to investigate. It appears the foundation stone was laid in 1904 so that rules out Victorian. Our unsuccessful search resulted in us returning to the town square where we opted to eat at the local “Spoons”. That actually turned out to be a very good decision with both of us selecting the all day brunch. Sausages, bacon, eggs, baked beans and chips. Most of the ingredients required cooking rather than the usual microwave reheating. Jan decided to return to Waiouru with our Sainsburys purchases whilst I headed to the cathedral. 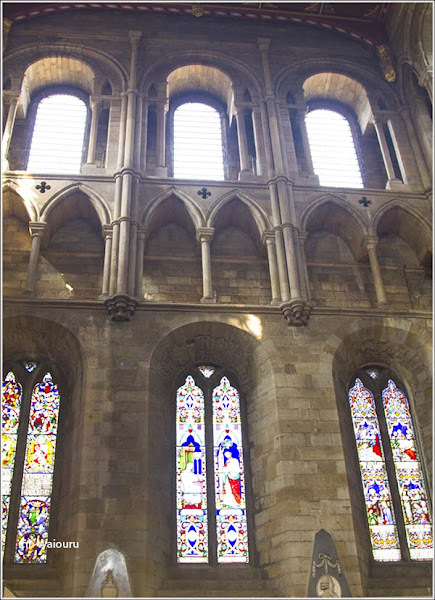 It was obviously not Norman because they tend to have small windows and thick walls, with a narrow nave. At this time they hadn’t worked out how to distribute the load from the roof down through the walls. 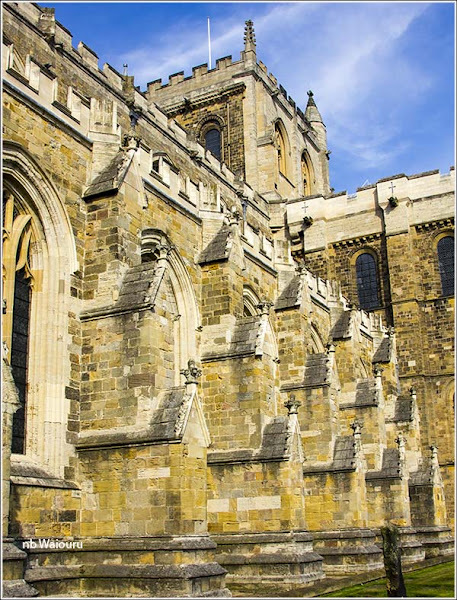 Cathedral builders subsequently learned how to incorporate more arches and “Flying buttresses to hold up the walls and ceilings. Ripon Cathedral appears to have been built in between these two designs. It has a nave but also the isles on either side. The roof is a mixture of stone and timber vault whilst the exterior walls are supported by stepped rectangular buttresses. 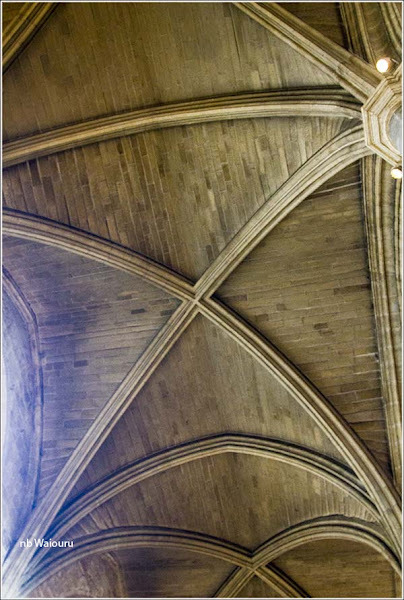 Stone vault ceiling over the isles either side of the nave. 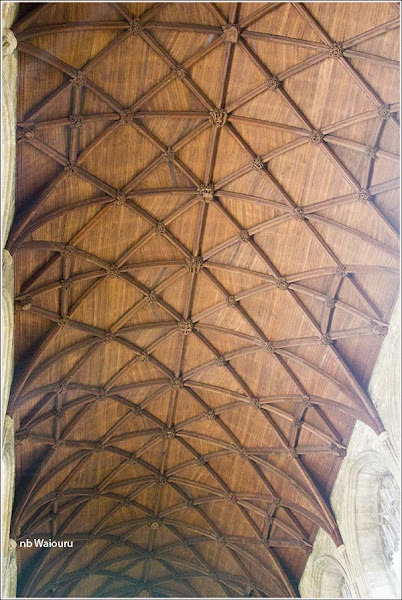 The nave has a timber ceiling. There is nothing particularly elegant about the buttresses. Inside, it is possible to see the lower stone walls are very thick at the base, but that they start to thin on the second and third tiers. 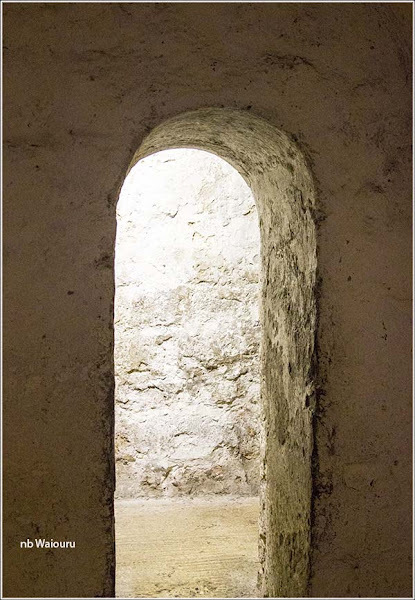 The oldest part of the cathedral is the Saxon crypt which reputedly dates back to 600-700AD. Not much to see down here!